Watch Video Below Titled "High Quality Mausoleum Design and Construction Overview"
Browse pictures of 1 crypt mausoleums, above ground burial vaults, 2 crypt mausoleums, private family mausoleums for sale and stately walk-in mausoleums in this PDF guide. Learn how Rome Monument designs, builds and installs elegant mausoleums using high quality granite, impeccable construction standards and old world craftsmanship. Get an understanding of the customization and ordering processes. Learn about high-grade granite, mausoleum foundations, base courses, architectural options and landscaping considerations. Rome Monument is one of the leaders in the cemetery monument and memorial industry. Watch Video Below Titled "How To Purchase A Private Family Mausoleum"
Rome Monument builds and installs private family mausoleums in cemeteries and on private property throughout the continental (lower 48) United States. Types of mausoleums include 1 crypt, 2 crypt, family mausoleums and walk-in mausoleums. If you are interested in ordering a custom designed mausoleum for yourself, you and your spouse, your parents, your children or other family members, please consider talking with Vince Dioguardi, the president of Rome Monument at 724-770-0100. Vince loves to talk about mausoleums and is very friendly, knowledgable and professional. During your phone conversation, he will be happy to explain how the process of ordering works, review how prices are determined, present your design customization options, touch on our mausolem construction standards and clarify mausoleum setting and installation details. If you prefer email to a phone conversation, please feel free to email Vince at info@romemonuments.com or contact him by using our Contact Form. 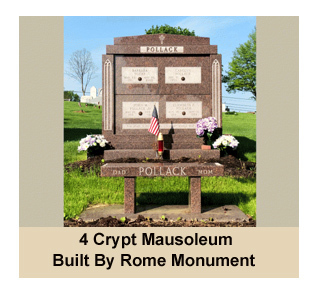 Rome Monument also sells community mausoleums, private columbariums, church and community columbariums, crypts, urns and niche nameplates and plaques. Founded in 1934, Rome Monument is a mausoleum construction company that custom designs and builds the highest quality private family mausoleums and columbariums in the United States. With manufacturing facilities in Pittsburgh, Pennsylvania, we transport and install mausoleums primarily throughout the United States. Watch a video to learn how to purchase a private family mausoleum. When people want to buy a high quality mausoleum, they call Rome Monument at 724-770-0100 to speak with Vince Dioguardi about the purchase, design and installation process. One way to determine the best mausoleum provider is to review their work. Click here to view examples of mausoleums we have built over the years. Listed below in this tutorial are typical cemetery mausoleum prices. More so than standard cemetery monuments, mausoleums are more frequently designed and purchased in advance of the passing of the people who will be memorialized by the structure. Learn about our Pre-Arranged Cemetery Monument Plan or request a brochure. Mausoleums are above ground structures that contain the crypt or crypts of the deceased. They can be as simple as a granite “butter dish”-style mausoleum that is just large enough to cover a coffin or casket. Or they can be as elaborate as a walk-in chapel-style mausoleum such as the Taj Mahal which is over 20 stories high and covers 42 acres of land in Agra, India. A mausoleum can hold one crypt or dozens of crypts for multiple generations of the same family. The Mausoleum of Augustus was built by Rome's greatest emperor in 28 BC on the Campus Martius in Rome, Italy. Augustus certainly planned ahead by starting on the mausoleum about 5 years before he passed away. View pictures of the new renovations of the Mausoleum of Augustus Caesar. It is scheduled to be opened to the public in 2019. In its day the mausoleum was the second largest funerary monument aside from the pyramids. From concept to completion, Rome handles all your private mausoleum design and construction needs. We contract with the area’s finest, most reliable companies and use only the highest grade materials, the most advanced construction processes and state-of-the art equipment in the construction of our one-of-a-kind custom mausoleums. Since building a mausoleum is similar to building a house, consideration needs to be given to the type of building materials used, the color of the granite, electricity, plumbing, additional rooms, spaces for artifacts, funerary art, frescoes, statues, number of crypts, and so much more. Our private family mausoleums are commissioned by individual families and usually constructed on a cemetery plot (s) or on one’s private property. Rome Monument owner and president Vince Dioguardi has designed and constructed a 9-crypt walk-in mausoleum – for his own family! He has gone through the entire mausoleum-building process, understands it intimately, and will help you through the process as well. Costs for single crypt mausoleums start at $15,000. Costs for two crypt mausoleums start at $23,000. Family mausoleum costs start at $28,000 for 3 crypt mausoleums. Costs for 4 crypt family mausoleums start at $35,000. Prices for estate mausoleums with 6 crypts start at $45,000. Prices for free standing family mausoleums with 8 crypts start at $55,000. Private family and estate walk-in mausoleum (2-4 crypts) costs start at $85,000. Prices for walk-in mausoleums for 6-8 crypts start at $145,000. Companion crypt mausoleum prices start at $22,000. Westminster Family Crypt prices start at $35,000. Mausoleums are not built only for the wealthy, prestigious, and self-important people of the world. They are built for every class, race, religion, social status, and job description. They are the interment option of choice for many, many reasons - practical, pompous and caring. Ed Peck of Boca Raton wants to be buried in a mausoleum because he feels it is fitting with his social status. "The mausoleum says, 'I'm really significant in this world, I think I'm really significant to my family’.” People who have made significant contributions in their lifetimes though their deeds and actions have a very good reason to celebrate that life with a mausoleum. Judy Garland has been laid to rest in a semi-private mausoleum named for her in a cemetery unlike any other in the world, the Hollywood Forever Cemetery. The Judy Garland Pavilion is intended as a final resting spot for Liza May Minnelli, Lorna Luft and other family members. The new Malibu Memorial Park, in Malibu California will have about 40 mausoleums priced at around $5 million each. Ed had another reason for being interred above ground. "It began to occur to me that I did not want to be in the ground covered with weeds and whatnot and totally forgotten," he said. "I don't like the idea of dirt being dumped on me." Ed isn’t the only person who gets creeped out by the thought of being underground for an eternity. It’s for that reason that the squeamish commission mausoleums for themselves. Baby boomers are arriving at that age where they are starting to think about how they will be interred. Yes, those same baby boomers who fought for an ecologically friendly world in the ‘60’s. Good news for Baby Boomers: a mausoleum that sits on top of the ground leaves far less of a footprint than a grave that is dug below the ground. Chapel or walk-in mausoleums are buildings that allow people to be more comfortable and be protected from the rain and snow and cold weather while visiting a loved one. Families can visit any time of year, in any weather, even on a rainy Labor Day weekend or a snowy Christmas day. Pictured to the right is a walk-in family mausoleum designed and built by Rome Monument for a Catholic family. These types of mausoleums are for sale with prices starting at $85,000 for 2 to 4 crypts. Walk-in mausoleums with 6-8 crypts start at $145K. Crypts are located in the interior of the free standing mausoleum. The mausoleum pictured here was sold to the Silvestri family and installed in the Mt. Olivet Catholic Cemetery. The solid mausoleum was constructed with high quality granite. It includes a glass door and a small vestibule (foyer). The name of the family, Silvestri, was carved into the granite above the door. A tall Catholic style cross was carved by the Rome artisans into the outer walls on each side of the doorway. The two granite steps in front of the doorway were also designed and built by Rome Monument. Play soothing music while you relax in a chair or on a bench and reflect on the life of a family member who passed. You don’t have to worry about other people, about insects or wind. Just relax and remember. Mausoleums are built to hold the remains of many individuals in one place. Past, current and future family members have a place to be interred along with other generations of their family. Rome Monument designed and constructed an eight crypt mausoleum for the Troiani family mausoleum which resides in the Beaver Cemetery and Mausoleum in Beaver, Pennsylvania. While mausoleums can be expensive, when the cost is split among all the family members who will be interred there, the cost becomes a mere fraction of the total cost of the mausoleum. Two crypt mausoleums are frequently purchased by a husband and wife who want to be interred together. Rome Monument designed a double crypt mausoleum for Otis Wesley and Daisy Wesley of Homewood, PA.
Burials are often a problem during the winter months, especially in the northern states. When the ground freezes, burials usually are put off till spring. That can be quite a long delay. Above ground mausoleums allow for burials even during the coldest Polar Vortexes – no delays! In the 1400’s Emperor Shah Jahan built a mausoleum for his wife, Mumtaz Mahal, to show his great and everlasting love for her. You can do the same for the love of your life. The mausoleum built for Mumtaz is the Taj Mahal. Yours can be a bit more modest if you prefer. To see an example of a private two crypt mausoleum, view the design we created for Anthony Lucadamo and his wife Florence. Inside your mausoleum, you can display photographs, murals, and personal artifacts that tell the story of your life. You can’t take it with you, but you can certainly leave it for your heirs to enjoy. What could be more meaningful? And what a great incentive for your family to come visit you at your final resting place. To see an example of a mausoleum that was designed and constructed for a married couple, while they were both still alive, click here. Cemeteries such as Cleveland's Lakeview Cemetery, founded in 1869, offer numerous above ground options for mausoleums. One of the most famous above-ground structures located in "Cleveland's Outdoor Museum" is the James A. Garfield Memorial. Mausoleum entombment provides a very dry and clean type of burial and minimizes the problems caused by ground burials. Side-by-side two crypt mausoleums are often purchased by married couples in advance of their eventual interment. Rome Monument designed and constructed one of these types of mausoleums for Walter R. Kasper and Margaret Kasper of Ambridge, PA. It is a fitting memorial for a fantastic couple. The first step in designing and constructing a mausoleum is deciding what type of mausoleum you want and how many family members it will hold. It is best to preplan for a mausoleum in advance of one’s passing so that decisions on the numbers of crypts and the style of architecture can be discussed among family members in an unhurried, thoughtful manner. A mausoleum can cost hundreds of thousands to millions of dollars, and can take months or years to design and construct, and therefore should be planned thoughtfully and with the whole family. Mausoleums come in all shapes and sizes, and can hold anywhere from one individual to entire families - even whole communities, as in public and church mausoleums. Mausoleums that are commissioned by families or individuals are called “private mausoleums”, and those that are created for churches, cemeteries, and placement on public grounds are called “public mausoleums”. In an above ground interment, anywhere from one to dozens of crypts (a stone chambered burial vault) (1) are used to store the caskets, coffins, or remains of the deceased in a mausoleum. Prices for private mausoleums built by Rome Monument start at $15,000. While we most often think of mausoleums as elaborate buildings erected for rich or prestigious people, they are, in fact, often simple stone encasements that surround the coffin and that are not much bigger than the coffin. Think of a butter dish that covers a stick of butter. The simplest mausoleums are single crypt mausoleums that hold just one casket. The crypt is approximately 2½-feet square and 8-feet long. The opening into which the casket is placed is covered with a “shutter”, a marble, granite or bronze front that can be highly decorative. A single crypt can be a mausoleum in and of itself, called a lawn crypt, or be placed in a larger mausoleum building. Prices for single crypt mausoleums, also referred to as 1 crypt mausoleums, start at $15,000. Pictured to the right is a single crypt mausoleum designed and built by Rome Monument. It was made with marble and set in Lancaster Cemetery in Lancaster, PA on November 2, 2016. It was built to memorialize Margaretha "Gretel" Dodge. A double crypt mausoleum contains two crypts to store two caskets. These 'companion crypts' can be placed back to back, side by side, or one on top of the other. Crypts that contain a combination of single and double (approximately 16-foot) crypts, are known as True Companion crypts. George and Donna Suznevich of Midland, PA purchased a side-by-side double-front covered crypt style mausoleum from Rome Monument for their eventual interment. Side-by-side 2 crypt mausoleum prices start at $23,000. Pictured to the right is a 4 crypt family mausoleum commissioned by the Pollack family. Prices for 4 crypt mausoleums start at $35K. Two crypts are side-by-side and two crypts are stacked on top. It was built by Rome Monument using mahogany granite and installed in December of 1999 at Mt. Olivet Catholic Cemetery in Pittsburgh, PA. Rome Monument sells and installs 4 crypt mausoleums throughout the United States. 5 crypt mausoleum costs start at $40K. 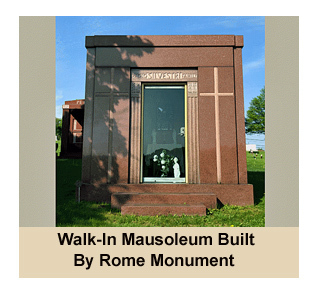 Click here to view more pictures of mausoleums built by Rome Monument. Private mausoleum buildings can hold one, two, or multiple crypts to accommodate many members of the same family. There are two types of mausoleum buildings: garden mausoleums and chapel mausoleums. In a garden mausoleum, crypt openings are on the outside of the building, In general, there is no entrance or indoor space in these structures. Garden mausoleums, also referred to as outdoor mausoleums or sepulcher mausoleums can be ordered from Rome Monument. Prices for garden mausoleums, which are open air structures without a defined walk-in interior, start at $200,000. Rome Monument built an elegant outdor garden mausoleum using a Greek-pillared neo-Classical style with white granite pillars. Chapel mausoleums have some or all the crypts inside the building, with an entrance and space for visitors indoors. The building might consist of two garden-type mausoleums with a roof connecting the two. The crypt openings of the buildings that are facing each other and under the roof would be considered interior crypts, whether or not the building is enclosed. In addition to the crypts, chapel mausoleums can incorporate niches in the walls to hold cremated remains. If the building is not enclosed, the project is called an ‘Open Chapel’ mausoleum. Buildings can include many hallways and might also contain work rooms, offices, bathrooms and actual chapels. The protected interior allows for art and artifacts to be displayed, as well as electricity and plumbing to be installed. Pictured to the right is a chapel style walk-in private family estate mausoleum. Chapel style walk-in mausoleum prices start at $180K. This 9-crypt chapel mausoleum was designed by Vince Dioguardi, the Rome Monument owner and president. 9 crypt family mausoleums without vestibules and doors are sold by Rome Monument with prices starting at $60K. The chapel mausoleum pictured to the right was constructed by Rome Monument craftsman and was built for the Dioguardi family using Rock of Ages granite. Granite is the most popular building material for exteriors for private family chapel mausoleums due to its strength, hardness and longevity. The roomy interior visiting space of the chapel mausoleum pictured here makes excellent use of ornate carvings, decorations, ornamentation and marble. An altar was placed in the center of the interior of this chapel mausoleum. The interior visiting space is used by the Dioguardi family for prayer, communion, reflection and worship. Multiple generations of the Dioguardi family are assured a space in this private family chapel style walk-in mausoleum. There are many variations to these types of mausoleums, which can be explored when you meet with designers at Rome Monument. Mausoleums are above ground structures that surround and protect tombs or burial chambers. While some are just large enough to encase a coffin containing the remains of the deceased, mausoleums are most often associated with buildings that have entrances to an interior room where family members can view the tomb(s) or burial chamber(s) of one or more persons. As buildings, mausoleums are designed and constructed in the architectural style of the day or of a certain historical period. Following are some of the more common historical architectural styles found in the design and construction of modern day mausoleums. Classical style mausoleums are based on Greek and Roman architecture that was prominent from about 900 BC until the 1st century AD. The Parthenon in Athens is a classic example of Classical Architecture. Tall columns supporting horizontal beams created a majestic look that was used in temples, open-air theater, public monuments, and mausoleums. Greek and Roman Classical architecture made a comeback in the 18th and 19th centuries with a style of architecture called Neoclassical. The White House and many of the original government buildings in Washington, D.C. are Neoclassical. This popular style borrows many elements from Classical architecture, including the grand scale, simple forms, and dramatic columns. Many mausoleums are built in the Neoclassical style. Pictured to the right is an elegant outdor garden mausoleum that is an open air structure without a defined walk-in interior. 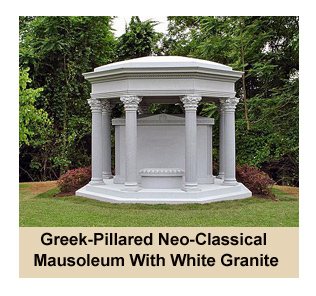 It is a Greek-pillared Neoclassical style mausoleum built by Rome Monument with white granite. The towering, highly ornamented cathedrals built in Europe from the 12th to the 16th century are examples of Baroque architecture. This style is distinguished by soaring towers, decorative spires and stonework, pointed arches, and, of course, spooky gargoyles. Notre-Dame de Paris, one of the largest and most-recognized churches in the world, is an example of Gothic architecture. Baroque style mausoleums today are designed with a simplified style of Gothic often referred to as Neogothic. Romanesque architecture originated in Medieval Europe. It is distinguished by its semi-circular arches, massive quality, thick walls, sturdy piers, groin vaults, decorative arcading, large towers, and almost perfectly regular and symmetrical plans. From the 6th to the 10th century, most churches and abbeys in Europe were built using Romanesque architecture, and many still remain across Europe. The semicircular arches, symmetrical design and thick walls remain the defining features of Romanesque mausoleums. They can also incorporate rusticated stone, medieval columns, and the divided arch in the bronze doors. A good example of a Romanesque mausoleum is the massive Walden-Myer mausoleum in the Forest Lawn Cemetery in Buffalo, NY. The Walden-Myer Mausoleum supports a giant stone globe on its roof. A beautiful Romanesque mausoleum designed by Rome Monument is the Pappan Family Mausoleum constructed in the Beaver Cemetery and Mausoleum in Beaver, PA.
Asian architecture in the United States is most often associated with the style found in pagodas. A pagoda is a tiered tower with multiple eaves and sloping roof, similar to a stupa design originating in South Asia. Stupas are a tomb-like structures where sacred relics are kept safe and venerated. The Ho Chi Minh Mausoleum in Vietnam is one of the world’s most visited Asian-style mausoleums. Ancient Egyptian architecture, with its extensive funerary art and its grand scale, is understandably used as the style of choice for many modern-day mausoleums. Pyramids, obelisks, sphinxes, Egyptian symbology, and frescoes and friezes are indicative of Egyptian mausoleum architecture. The F.W. Woolworth Mausoleum in New York City contains all the elements of a classic Egyptian style mausoleum. A good example of a mausoleum designed and built using an Egyptian Revival architecture style is the Kilmorey Mausoleum, in London. The mausoleum was constructed in the style of an ancient Egyptian monument and is considered a great example of an Egyptian-style mausoleum. In the late 19th century and early part of the 20th century, Pyramid mausoleums were part of the Egyptian revival architecture movement in the United States. Actor Nicolas Cage had a 9ft pyramid shaped mausoleum designed and constructed in the historic St. Louis No. 1 cemetery in New Orleans. The Martin Ryerson Tomb, designed by Lous Sullivan is an Egyptian Revival that blends two different types of Egyptian-style buildings, the pyramid and the mastaba. The Ryerson Mausoleum is one of three tombs that Louis Sullivan designed during his career. It is located in the historic Graceland Cemetery in Chicago, Illinois. Islamic style architecture is found in the mosques, tombs, palaces and forts of countries where Islam is worshipped, and is most prevalent in the Near East, North Africa and East Asia. The basic form of an Islamic Mausoleum is a cube topped by a dome, with an open space near the center of the dome below which is an underground chamber that functions as the tomb. Minarets often flank the structure. The surface is covered with elaborate decorations and ornamentation. calligraphy, abstract geometric elements, and floral patterns. The Taj Mahal has all the characteristics that are common in an Islamic Mausoleum. You have a reason to build your mausoleum. You are familiar with the different architectural styles of mausoleums. You know the different types of mausoleums and the number of crypts they can hold. If you need help with any of these, Rome Monument can provide you with all the information you need to understand everything that is involved in the design and construction of your private family mausoleum. Prior to building the mausoleum, it usually takes months of discussions and drawings before coming up with a finalized architectural blueprint that is used to create your mausoleum. For that reason, we highly recommend starting the mausoleum design process well in advance of a family member’s passing. This is called preneed planning. Many, many decisions need to be made and they are best discussed in a family setting where thoughtful and thorough discussions can take place. A Rome Monument mausoleum design not only includes plans for the exterior and interior walls and roof of the structure, it includes lettering styles (any language), portraits, pictures, bas relief, statues, engravings and etchings that personalize each mausoleum for your family and often include symbols and imagery that convey the specific nationality or religion of the deceased. You can select from a wide variety of granite colors in different price ranges, including: red granite mausoleums, black granite mausoleums, gray granite mausoleums, and any other color granite mausoleum you desire. For Chapel Mausoleums, we can add even more, including sentimental artifacts and memorial accessories such as statuary, murals, vases, stained glass windows and more. The possibilities are limitless, the effect eternal. Once you have chosen the architectural style and the items you want included in the mausoleum, our team will refine the design based on further discussions with you, our architects and trades people (plumbers, electricians, etc. if necessary), and deliver a fully realized CAD drawing for your approval. We will continue to make refinements and adjustments in the design until you are completely satisfied. Once the mausoleum design and cost are approved, we assemble the team that will make your mausoleum design a reality, including trusted architectural design and construction professionals. Then the mausoleum is delivered to the cemetery and assembled at the site. However, the construction process is still not completed. If the design calls for it, plumbing and electricity needs to be set up. We use only the most advanced techniques and state-of-the-art equipment to ensure that your mausoleum is of the highest possible quality and efficiency to decrease costs. Our impeccable processes are the result of our expertise gained from over 80 years of experience building the highest quality mausoleums! Once again, mausoleum design and construction is a costly and time-consuming process (of course, well worth for families desiring an exceptional resting place). For that reason, we recommend starting the design process right away, instead of waiting till it’s too late for all family members to be involved in the process. Once a design is approved, some mausoleums take months to build. Others take years to complete. The construction of Grant’s Tomb took six years from groundbreaking to dedication. Of course, Grant’s Tomb is the second largest mausoleum in the Western hemisphere. Landscape plans may also be included at the instruction of the family. 1) Construction starts with quarrying the granite that will comprise the structure of the mausoleum. Granite is the ideal material use for mausoleums because its beauty, strength, and long-long lasting durability (centuries with essentially no deterioration). We use only the highest quality granite from the most respected quarries in the United States and around the world, including Rock of Ages in Vermont. 2) In Rome Monument’s mausoleum production facility, our team of expert architects, highly skilled stone cutters, electricians and other tradesmen faithfully follow construction drawings that include detailed architectural, structural, mechanical and electrical plans for the structure. The granite is cut to the blueprint’s exact specifications by Rome’s expert craftsmen. The crypts, statues, and other funerary art is carved and finished. Crypts and walls are enhanced and embellished with artwork, lettering, etchings and engravings that personalize the mausoleum and often include religious symbols and imagery that reflect the religion of the deceased. carvings, engravings, and etchings. Stained glass windows, frescoes, murals, bas reliefs and other embellishments are designed and created at Rome Monument. This process can take months or even years to complete. Each custom designed and custom mausoleum is built with granite modules (walls, roof, and other features) produced at our mausoleum construction facility in Pittsburgh and then transported to the cemetery and assembled on site. 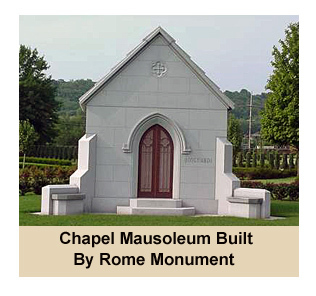 Rome Monument also works with mausoleum design and construction contractors to build mausoleums. Rome Monument collaborates with the best quarriers, fabricators and finishers of granite along with other cemetery businesses to build community mausoleums, private family mausoleums, above ground mausoleums and private estate mausoleums. 3) A concrete or granite foundation is built on the site where the mausoleum will be assembled. 4) The completed mausoleum modules are transported to the cemetery. 5) The mausoleum is assembled on the foundation to exacting specifications. Walls, roof, columns, posts, ballisters, polished granite, wood or tile floor, crypts, glass or stained glass windows, stairs, nameplate, and bronze doors are added one by one, with the highest quality craftsmanship and care, until the mausoleum becomes the beautiful work of art you envisioned. 6) After assembly of the main structure, all art, artifacts, funerary art, windows and doors and other accessories will be placed in and around the mausoleum. Statues are placed on the grounds or in the building, bas reliefs, lettering and artwork are etched and engraved on the polished granite. 7) Landscaping, if called for, will be performed. a design/builder of private family mausoleums for cemeteries and memorial parks. We design, build and install single crypt mausoleums, two crypt mausoleums, private estate mausoleums, family mausoleums, chapel mausoleums and garden mausoleums for families throughout the United States. In this video on YouTube, Rome Monument takes you through the steps on how a mausoleum is designed and built. It follows the construction of a Greek Neoclassical-style mausoleum for the Pappan family of Pennsylvania that was installed in Beaver Cemetery, Beaver Pennsylvania in 2015. 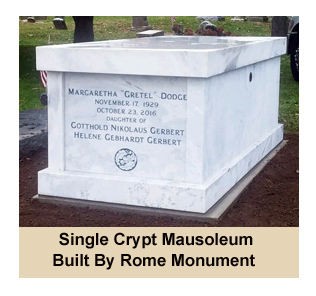 Rome Monument is a mausoleum construction company, mausoleum contractor and mausoleum builder with over 80 years of experience as a design/builder of private family mausoleums for cemeteries and memorial parks. We draft mausoleum design plans using CAD software and present these drawings and renderings to our clients for approval before beginning construction. Click here to see a preliminary family mausoleum construction design plan made using a CAD program. The cost of a private family mausoleum is based on the type, size, style, shape, design, ornamentation, number of crypts, and materials used. You can select from a wide variety of granite colors in different price ranges. Details of crypt – art, etchings, engravings, photographs, etc. Details of crypts – art, etchings, engravings, photographs, etc. Details of crypts and mausloseum– art, etchings, engravings, photographs, etc. Details of crypts and mausoleum– art, etchings, engravings, photographs, etc. By purchasing a family configuration, you can split the costs among family members, which will considerably lower the overall cost of entombment in a mausoleum. Watch a video produced by Rome Monument titled "See Inside Large Mausoleums Built for Famous Americans". This video showcases large fancy mausoleums designed and built as monuments for the entombment of famous Americans. The video features the Lincoln Tomb, Grant's Tomb, William McKinley Tomb, the Royal Mausoleum of Hawaii, Will Rogers Shrine of the Sun and the Lillian Russell Moore Mausoleum. Find out how these famous tombs and interment spaces were designed and constructed, how much it cost to build these historic mausoleums, and what it costs to build a beautiful private family mausoleum in 2018. A very interesting article about famous mausoleums was written by Douglas Martin for the New York Times is titled "Deathstyles of the Rich and Famous". Throughout history, mausoleums have served an important role in cultures throughout the world. Following are some of the more prominent mausoleums. The term mausoleum itself comes from the name of the 4th century Persian Governor, Mausolus, who was buried in a magnificent above ground structure originally called the Tomb of Mausolus. Now known as the Mausoleum at Halicarnassus in Halicarnassus, Turkey, it was planned by Mausolus himself and designed by Greek architects Satyros and Pythius. It is one of the Seven Wonders of the Ancient World. The Mausoleum was approximately 150 in height, and the four sides were adorned with sculptural reliefs. The tomb sat on an enclosed platform in the center of the courtyard. Ornamentation included stone lions, statues of gods and goddesses, stone warriors mounted on horseback that guarded the tomb, bas-reliefs showing action scenes, statues of four massive horses pulling a chariot in which rode images of Mausolus and his wife Artemisia. Completed in 350 BC, the mausoleum was eventually destroyed by a series of strong earthquakes. The Mausoleum of the First Qin Emperor, Qin Shi Huang, is home to the now world-famous terracotta army, 6,000 incredibly detailed and life-size Terracotta Warriors whose purpose was to protect the Emperor in the afterlife from evil spirits. There is also an army of chariots and 40,000 real bronze weapons. The mausoleum was started in 246 BC upon the orders of the young king himself. It took 700,000 men to construct the mausoleum which was finally completed in 208 BC, 39 years after it was started. The tomb includes replicas of palaces and scenic towers, rare utensils and wonderful objects, 100 rivers made with mercury, representations of "the heavenly bodies", and crossbows rigged to shoot anyone who tried to break in. The Mausoleum of Genghis Khan, built between 1954 and 1956 in Inner Mongolia in China, is a temple devoted to the worship of Genghis Khan, who died in 1227. Ghengis Khan was a famous Mongol military leader, founder of the Mongol Empire, and considered the unifier of modern China. The mausoleum is a cenotaph (the coffin contains no body but only headdresses and accessories) because the actual Tomb of Genghis Khan has never been discovered. Outwardly, the mausoleum has the appearance of three Mongolian yurts. Inside, there is a statue of Genghis Khan, a map of the vast territory of the Yuan Dynasty, and frescos depicting the life of Genghis Khan and the great deeds of his grandson-Kubla Khan, who was as great a leader as his grandfather. The Guri Amir is a mausoleum of the 14th century Asian conqueror Timur (Tamerlane). Located in Uzbekistan, it is important because its Persian-Mongolian architecture was a model for later Mughal architecture tombs, including the Taj Mahal. The eight-sided building is crowned by a dome which contains the tombs of Tamerlane, his sons, grandsons, and Timur’s teacher. The entrance portal is richly decorated with carved bricks and various mosaics. The inside the mausoleum is a large, high chamber with deep niches, paintings, and high-relief papier-mache cartouches. Much of the structure has been destroyed and what remains has been heavily restored. While many mausoleums are commissioned and planned by important leaders who will be enshrined in them, the Taj Mahal was built by Mughal Emperor Shah Jahan not for himself, but for his favorite wife, Mumtaz Mahal. The mausoleum is constructed of white marble with a large central dome surrounded by four smaller domes. On the massive grounds are long pools of water and a red sandstone mosque. Inside the mausoleum, there is marble chamber that houses the cenotaph, or false tomb, of Mumtaz Mahal. Shah Jahan intended to build a mausoleum across the river for his own remains. Unfortunately, when his third son with Mumtaz Mahal deposed his father and took power himself, Shah Jahan lived out under house arrest. No mausoleum was ever built for him. Many important French citizens, including writer Victor Hugo and scientist Madame Curie, are entombed in the Pantheon, a building located in Paris. Originally built in the mid-1700’s as a church, it was turned into a mausoleum in 1791. It is built in the Neoclassical style, with a façade modelled on the Pantheon in Rome, on top of which sits a dome. Designer Jacques-Germain Soufflot intended the structure to resemble a Gothic cathedral with classical principles, but when it became a mausoleum, the great Gothic windows had to be blocked. Napoleon Bonaparte, Corsican soldier and French emperor who died in 1821, is entombed in a massive sarcophagus under the dome of Les Invalides in Paris, France. The mausoleum was not completed until 1861, forty years after his death. Members of Napoleon's family, several of his military officers, and other French military heroes are also buried at Les Invalides. On April 15, 1865, the day President Lincoln died, a group of Springfield citizens started a successful drive to collect funds to construct a memorial or tomb for “Honest Abe”. Its main feature is an obelisk which rises over one hundred feet. [http://www.lincolntomb.org/tomb.htm]. Inside, a rotunda and corridors contain versions of important Lincoln statues, as well as plaques with excerpts from Lincoln’s famous speeches. There are four bronze sculpture groups, each representing one of the four Civil War military services. The bodies of Lincoln, his wife and three youngest of his sons are placed in crypts in the mausoleum. Grant's Tomb honors the life of Civil War General and 18th President of the United States Ulysses S. Grant. It was commissioned in 1885 by the Mayor of New York following Grant’s death in 1877. An open competition was held for the mausoleum’s design, which was won by John Hemenway Duncan. Duncan’s objective was "to produce a monumental structure that should be unmistakably a tomb of military character…and the epitome of reverence and respect”. Needless to say, he succeeded in his vision. The tomb's granite exterior is modeled after the Mausoleum of Halicarnassus with Persian elements. The twin sarcophagi of Grant and his wife Julia are similar to the sarcophagus of Napoleon Bonaparte at Les Invalides. Mosaics with scenes of Grant’s famous Civil War victories are found within the tomb. Located in Upper Manhattan, New York City, Grant’s Tomb is the second largest mausoleum in North America. Queen Victoria, long-reigning Queen of the United Kingdom who died in 1901, is entombed in the Royal Mausoleum on the grounds of Windsor Castle in Berkshire, England. The exterior of the mausoleum is inspired by Italian Romanesque buildings and is shaped like a Greek cross. The monumental tomb features recumbent marble effigies of the Queen and her husband, Prince Albert. The building was finished 1862. All mausoleums are tombs. However, not all tombs are mausoleums. A tomb is an enclosed interment space or burial chamber for the remains of the dead. They are generally found in or under religious buildings, in cemeteries or churchyards, in catacombs, on private land or, in the case of early or pre-historic tombs, in open landscape. A mausoleum is a type of tomb that takes the form of an above ground, free-standing structure that acts as both monument and place of interment for individuals or families. Tombs date back to prehistoric times, are found on every continent, and take on many forms. A tumulus is a mound of earth and stones raised over a grave or graves. In the Americas, Indian burial mounds are type of tumuli. Indian burial mounds date back to at least 3400 BC. The largest mound site in the United States is Cahokia Mounds located near St. Louis, Missouri. Tumuli are common throughout the world and are also known as barrows, burial mounds, Hügelgräber or kurgans'. A sepulchre is a cavernous rock-cut space for interment, generally associated with the Jewish or Christian faiths. Well-known sepulchers in the Holy Land include the Tomb of Jesus in the Church of the Holy Sepulchre. Megalithic tombs are above ground prehistoric burial chambers, built of large stone slabs laid on edge and covered with earth or other smaller stones. They are a type of chamber tomb, and were built across Europe, the Mediterranean, and neighboring regions mostly during the Neolithic period. Hypogeum tombs are stone-built underground structures for interment, such as the tombs of ancient Egypt, and date back to 3600 BC. Christians built similar structures which they called catacombs. Hypogea often have niches for cremated human remains or loculi for buried remains. The Northern and Southern Mazghuna pyramids, and the Southern South Saqqara pyramid are examples of Egyptian hypogea. A kokh tomb complex is a series of long narrow shafts, in which the deceased were placed for burial, radiating from a central chamber. These tomb complexes were generally carved into a rock face, and were usually closed with a stone slab. A kokh tomb complexes can be found at the far west end of the Church of the Holy Sepulchre in Jerusalem and throughout the Judean foothills. A pillar tomb is a monumental grave with a single, prominent stone pillar or column as its central feature. Many world cultures incorporated pillars into their tomb designs. Examples of pillar tombs are the Harpy Tomb of Xanthos in the ancient Greek colony of Lycia in Anatolia, and the tombs at Malindi and Mnarani, built by the medieval Muslim Swahili culture of the Swahili Coast. A rock-cut tomb is a burial chamber that is cut into an existing, naturally occurring rock formation, usually along the side of a hill. It was a common form of burial for the wealthy in ancient times in several parts of the world. Important examples are found in Egypt between the Valley of the Kings and the Valley of the Queens, and in southern Jordan, most significantly the city of Petra. Its towering, intricate rock-cut architecture has earned the designation of one of the “New Seven Wonders of the World”. Cist tombs are small stone coffin-like boxes or ossuaries used to hold the bodies of the dead. This type of tomb was used from Prehistoric times to the Middle Ages in Europe and Asia. The grave can be lined with stones and covered with stone slabs, or enclosed on all four sides by stone slabs and covered with a lid. A sarcophagus is a stone-carved box-like container for a body or coffin, often decorated with art, inscriptions and carvings, sometimes part of a monument, and most often displayed above ground. It can stand within a religious building or greater tomb or mausoleum, though it can also be buried. First used in Ancient Egypt and Ancient Greece, its popularity spread throughout the ancient world. These cultures revered their dead, preserving the mummified body in the sarcophagus and including items of value for them in the afterlife. It was often used in later years of European society by high status members of the clergy, government, or aristocracy. An example of an ancient sarcophagus is ancient Egypt’s pharaoh Tutankhamun. The sarcophagus was used primarily to protect the wood coffins that were placed inside it as well to protect the mummified body from the elements. Catacombs are ancient, human-made subterranean cemeteries that contain individual tombs (usually sarcophagi). Any chamber used as a burial place is a catacomb, although the word is most commonly associated with the Roman Empire. Their catacombs date back to the 2nd century AD, and a well-known example is the Catacombs of Rome. Burial crypts are stone or brick-lined underground spaces for interment, usually vaulted and beneath a religious building such as a church, usually for groups of people, either general public or private families. They may contain church monuments, sarcophagi or coffins. More recently, the term crypt has come to mean a stone chambered burial vault used to store the deceased. Crypts are usually found in cemeteries and under public religious buildings, such as churches or cathedrals, and beneath mausolea or chapels on personal estates. Wealthy or prestigious families will often have a 'family crypt' or 'vault' in which all members of the family are interred. In some regions, an above ground crypt is commonly called a mausoleum, which also refers to any elaborate building intended as a burial place, for one or any number of people.